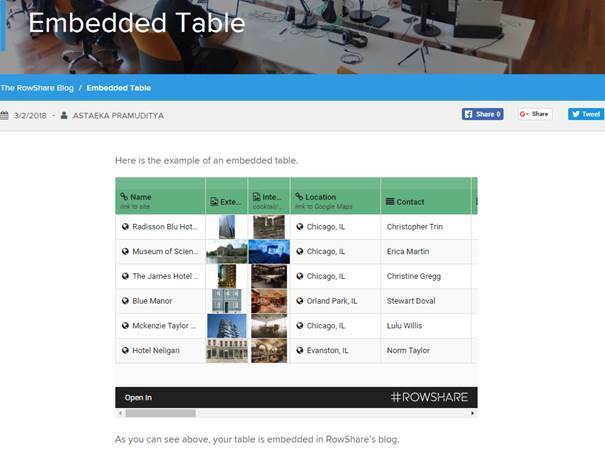 You can embed a read-only version of any RowShare table to your own web site or blog. Any modifications carried out from RowShare will be automatically synchronized in the embedded tables. If you are using RowShare Business, you can hide the black bar with the RowShare logo and link. Keep in mind that you will share your table with users who might not have a RowShare account. Therefore your table should allow all users to read all rows, and RowShare Business tables should also “Allow External Access” or the embedded table will not be displayed.